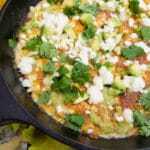 The Best Roasted Poblano Bean Dip | Mexican Appetizers and More! I made this dip a few days ago and in less than twenty-five minutes I had one of the best dips ever brought to you by Mexican Appetizers and More. I cannot stress enough how much you must make this dip. 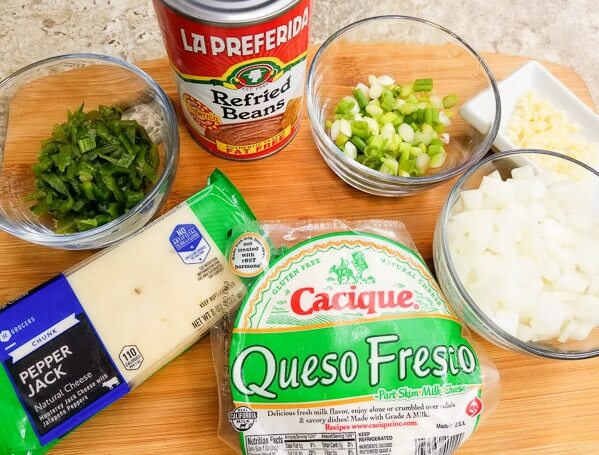 If you love queso fundido recipes this one will quickly become one of your favorites. 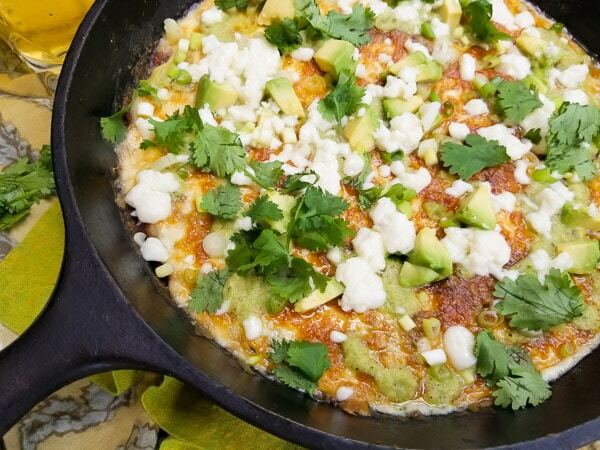 The key ingredient in the best roasted poblano bean dip is of course, the poblano pepper! A poblano pepper is a very mild chile pepper ranging between 1,000-2000 on the SHU (Scoville Heat Unit) which is a measurement system used to determine the heat in peppers. To give you an idea how mild the poblano pepper truly is, let’s compare it to two other famous mexican peppers, the jalapeno and serrano peppers. The jalapeno measures 2,500-8,000 units and the serrano pepper measures 6,000-23,000 units. Do poblanos peppers have to be roasted to eat? Poblano peppers taste best when roasted because it enhances their smoky flavor while softening the pepper. 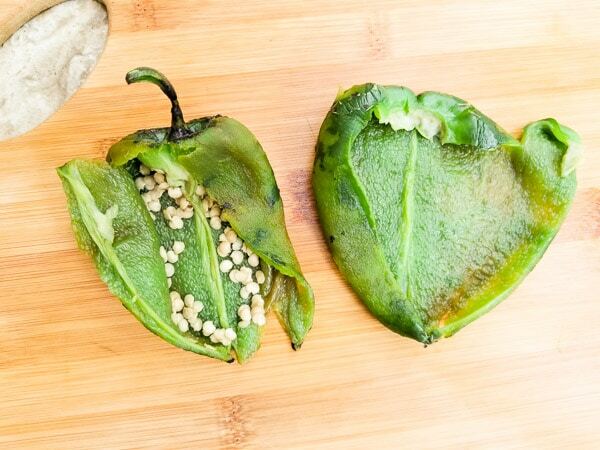 There are several ways to roast this fantastic pepper. Directly over an open flame, in a broiler, in the oven, on a grill or a cast iron grill. Yes, when roasting poblano peppers they must be peeled to remove the tough outer skin which also makes them easier to digest. Times may vary when roasting but normally anywhere between 10-20 minutes. 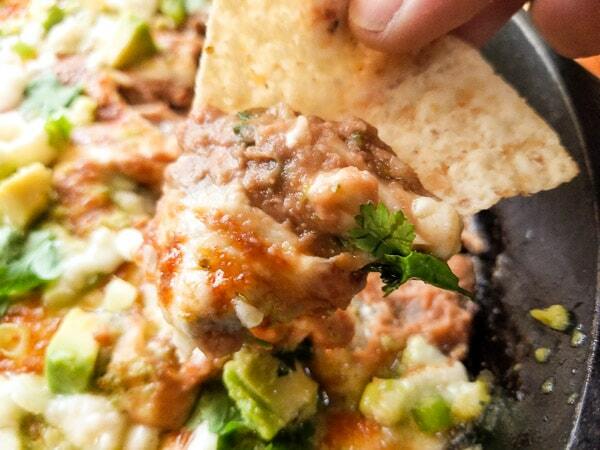 The Best Poblano Bean Dip is by far one of my top favorite dips. Definitely a crowd pleaser!! Made with roasted poblano peppers, onions, scallions, garlic, cilantro, refried beans, shredded pepper jack cheese, topped with a poblano sauce and finished with queso fresco, scallions, avocado cubes and more cilantro. Excellent dip!! In an oven at 450 degrees broil poblano peppers for 15 minutes. Turn over after 7 minutes to roast on the other side. Note: You can also roast peppers holding over an open flame on stove top. Hold one pepper at a time, with a pair of tongs and turn over on all sides to roast. After peppers have sweat, rinse under cold water and remove charred skin with fingers. Cut peppers open with a knife and rinse seeds out. Remove stems. Now peppers are nice and clean! Heat oil in a cast iron skillet over medium heat. Add onion, garlic. Cook for 5 min or until onions are translucent. Add one chopped poblano pepper, scallions and cilantro. Stir all together. Lower heat. 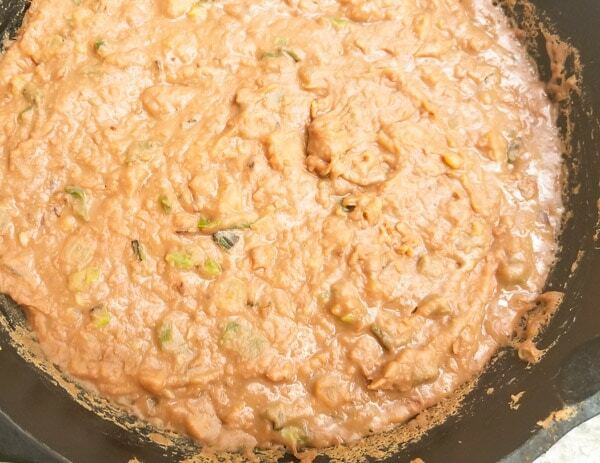 Add refried beans and spread out in skillet. Add shredded cheese on top of refried beans. Place skillet in oven and broil for 10-15 min. Make sure not to burn cheese. 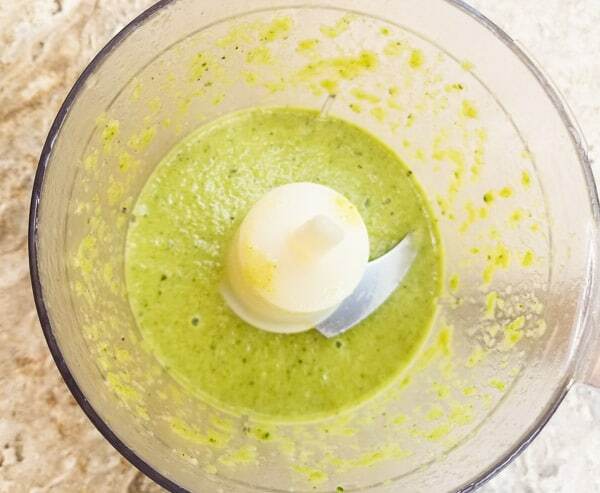 While skillet is in oven, place all ingredients for poblano sauce in a blender or chopper and blend together. Add a pinch of salt if you like. Once dip is ready and out of oven, spoon poblano sauce on top of dip. Serve with tortilla chips (or warm tortillas or burrito wraps). 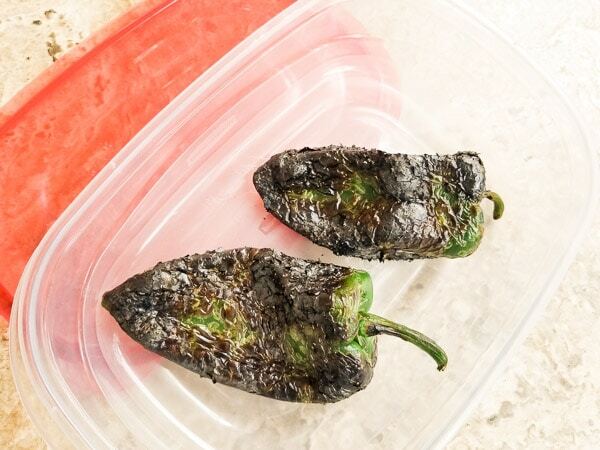 After roasting poblano peppers cover them to sweat. Note: Poblano pepper on the right is fully cleaned. Other ingredients for the best roasted poblano bean dip. 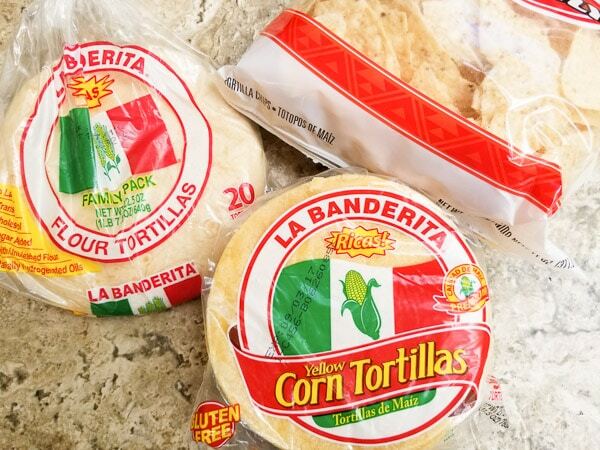 Can serve with warmed flour or corn tortillas or simply tortilla chips. 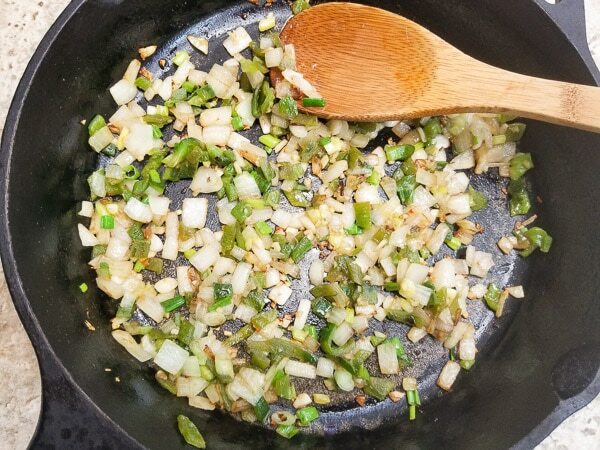 Add onion, garlic, poblano pepper and scallions to a skillet. Then refried beans and cilantro, mix all together. Top with cheese. (sorry no picture here) Bake. 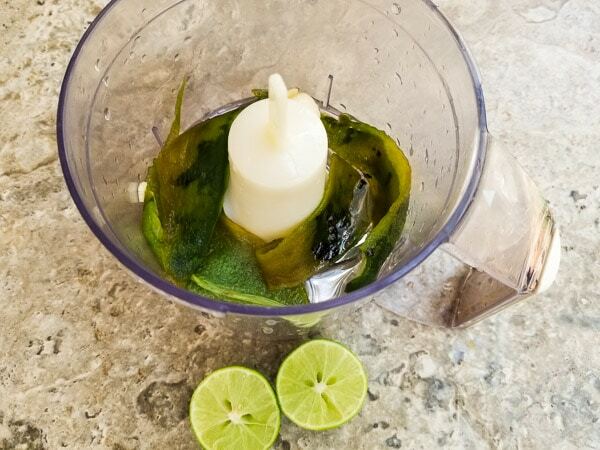 Put all ingredients in a chopper or blender. You will sprinkle poblano sauce on top of dip with a spoon after it has baked. Optional: Top the best roasted poblano bean dip with cubed avocado, scallions, queso fresco and more cilantro for more deliciosness! When will you be making this fabulous dip? I’ve been asked by several people for the recipe!! It was even suggested to to put it in a tortilla with some meat, oh yes! I wanted something different to share and all I did was Google poblano pepper dip and up this popped, thank you, thank you!! THANK YOU BETH! I love this dip so much too!! SO happy you and your friends really enjoyed it! And roasting the peppers on the campfire how perfect! YUM! Yes, I agree I need to double up on the sauce because it is truly soo good! And putting it on a tortilla with some meat?! 😋 I think you just gave me one of my next appetizers! I will dedicate that post to you! 😉 😊 Thanks again Beth! Also Beth, if you like mushrooms and garlic you may like this dip, Garlic and Mushroom Queso Fundido Dip, it’s not a poblano level dip, 😊 but it’s another one of my favorites. Let me know if you make it! We are always looking for new dips to serve up at parties and this looks like a great option. So much flavour in it! This recipe looks delicious but I especially am thankful for your info and tips about the peppers. So helpful! Perfect! So glad it was helpful and I promise you will love this dip! SOO GOOD! Looks delicious! 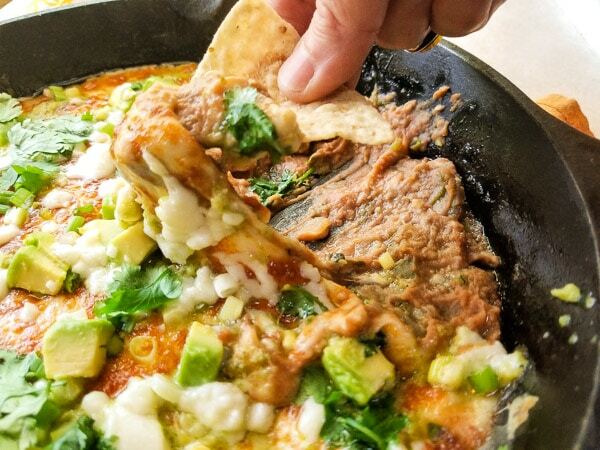 I’d have to double up a batch of refried beans (they always go super fast) so I can have some left over to give this dish a try. You definitely will need it Chantal! This really is the best! I loved every flavor in this dip and will definitely be making again. Thank you Noelle! This is one of the best dips ever I must humbly say!